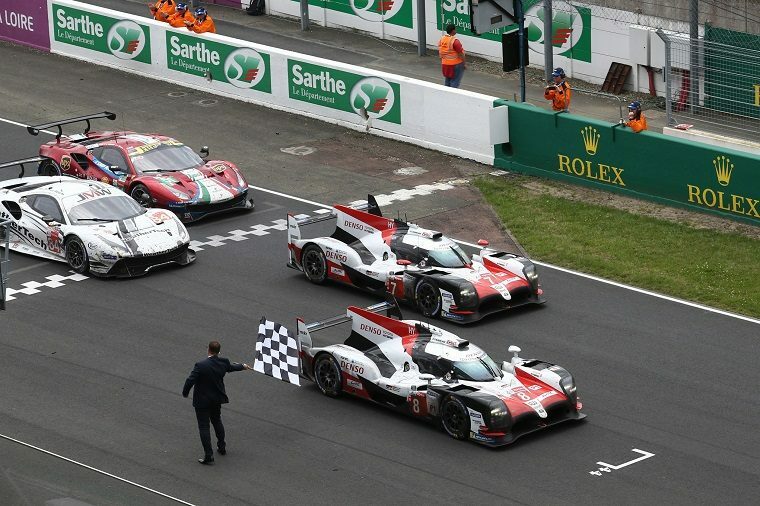 After years of trying, Toyota has finally done it and won Le Mans—what’s more, it did it with a near-perfect 1-2 drive from the front row and so convincingly that that few could deny the manufacturer couldn’t have won had Audi and Porsche not dropped out of LMP1. Toyota’s achievement marks only the second time a Japanese automaker has claimed victory at the 24 Hours of Le Mans, the first having been claimed by Mazda in 1991 with the screaming, rotary-powered 787B. But the headlines will almost undoubtedly all make mention of Fernando Alonso, who was part of the roster of drivers to take the winning #8 Toyota TS050 Hybrid home, adding the second of three titles he announced he was pursuing last year. Though many had believed any potential Alonso victory at Le Mans would be marred by the relative lack of competition, the #8 car still had the #7 Toyota to contend with, and Alonso was instrumental in helping his team win the duel. After Sebastian Buemi sped in a slow zone and earned a 60-second penalty, the #8 car had a lot of ground to recover. During his night stint, Alonso closed the gap from 2 minutes and 17 seconds to just 42 seconds. Then Kazuki Nakajima took over and managed to get past the sister car, after which it was a fairly easy cruise to the finish. Nakajima, who had been at the wheel of the 2016 car that broke down just over a lap before crossing the finish line, finally got his win. Now that Alonso has his Le Mans trophy, he only needs the Indy 500 to earn the unofficial Triple Crown of Motorsports, and many believe he may drive full-time in IndyCar next year, in light of how poor McLaren’s season has been despite changing engine suppliers. That could give Alonso the chance to do even better than just the Triple Crown: with Toyota, he has a very good chance to win the 2018-19 WEC super-season. If he can do that and then go one to win both the Indy 500 and the IndyCar championship, he’ll not only have the crown but also be the only man in history to win a championship in all three of the world’s top single-seater motorsport categories.